I thankfully don’t recall too many of my elementary school lunches. They were frequently a traumatic experience for picky eaters like myself, whether I purchased a hot lunch in the cafeteria or brought one from home (my mom pretty well gave up at some point and started sending me with just a baggie of carrot sticks because I’d bring everything else back untouched). I do remember liking the school’s tacos for some reason, but more than that, the cowboy coffee cake that came with it as a sort of dessert. 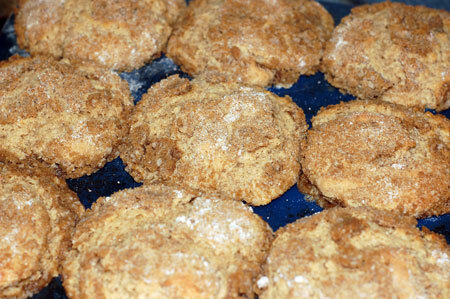 It was a simple, fluffy beige cake with a crumb topping, cut in squares and smelling sweetly of cinnamon and spices. The fact that it was more like breakfast food than lunch food didn’t hurt. 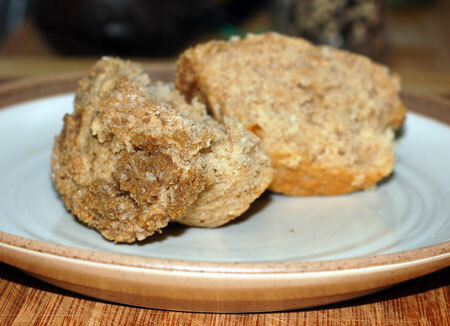 When I picked out the allspice crumb muffins from Dorie for this weekend’s breakfast bread, I had no idea that they would conjure up such a strong memory of that cowboy coffee cake. Fluffy and brown with a sturdy streuseled cap, they were lightly perfumed with pure allspice, one of my favorite baking spices. They lasted us for two breakfasts, and I’m already contemplating making a second batch. Center a rack in the oven and preheat to 375F. Butter or paper the 12 molds in a regular sized muffin tin or use your handy-dandy silicone model. Bake for about 20 minutes, or until the tops are golden and a thin knife inserted into the center of the muffins comes out clean. Transfer the pan to a rack and cool for 5 minutes before carefully removing each muffin from its mold. The recipe has a yield of 12; I overfilled my pan a bit because it produces smallish muffins, and had enough batter for about 10-11 muffins. Source: Adapted from Baking: From My Home to Yours by Dorie Greenspan. Oh, how I love crumb toppings!! These are calling out for me! !